I probably wouldn’t have thought of trying to bake soda bread if I hadn’t seen it mentioned during a an old River Cottage program I happened to watch recently. If I’m honest I would have guessed that soda bread must be something like sour dough which I believe takes some time and effort to make and that is not my sort of thing. It’s possible that I have this wrong as I’ve not made sour dough (yet) but I can’t usually be bothered with recipes that need leaving overnight or bursts of activity every so often – it must be an attention span problem on my part! 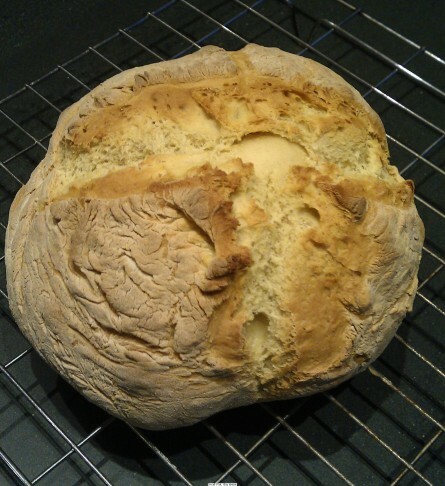 I found this handy soda bread recipe on the web which also describe what to do when there is no buttermilk. This is essential for me as we never normally have that and certainly didn’t have it when I decided to try making this! It all seemed fairly straightforward so away I went and a short time later a nice looking loaf of soda bread was cooling on a rack. The only minor catastrophe was (I think) a misreading of the quantities when not using buttermilk but I managed by just adding more and more flour until the consistency looked about right! As can be seen, the final result was pretty impressive to my untrained eye and by the morning there was only enough left for a couple of slices of toast! 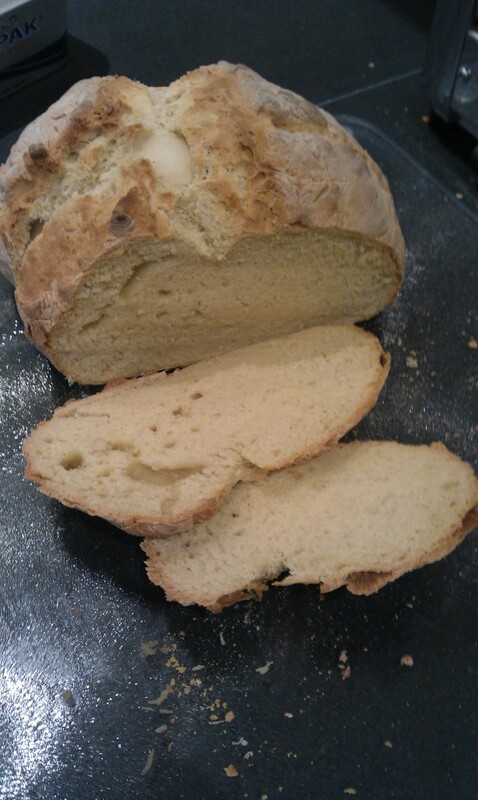 When the whole loaf goes that quickly it can’t be all bad, just imagine what would have happened if I’d made a “proper” soda bread rather than this first test run. Next on my list of breads to try is maybe adapting this focaccia recipe on the BBC website which I might attempt to make into a garlic/cheese “tear and share” to go with some pasta.